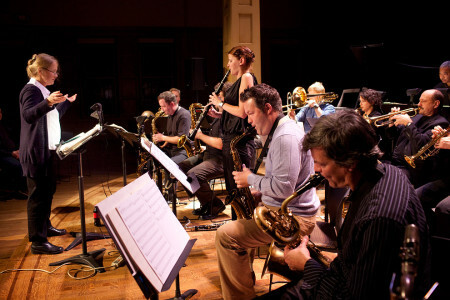 Robin Holcomb, Wayne Horvitz, and Tom Varner lead this adventurous 15-piece ensemble featuring top-ﬂight Seattle improvisers and composers including Mark Taylor, Thomas Marriott, Eric Barber, Byron Vannoy, and Phil Sparks. Tonight, WACO presents an evening of music specially suited for the gorgeous acoustics of the Chapel Performance Space at the Good Shepherd Center. Approaching the traditional jazz big band as a “pocket orchestra,” the program will feature four extended compositions by Holcomb, Horvitz’s concerto for clarinet “River of Whiskey,” featuring guest clarinetist Beth Fleenor, and Chris Stover’s “The Murderess.” The program will also include the Seattle premier of “Laredo,” written for saxophone quartet by Holcomb, and commissioned by the Rova Saxophone Quartet.